 If you enjoy hiking, be it a day trip or an overnight on the trail, there’s plenty of opportunities in the Cadillac area. 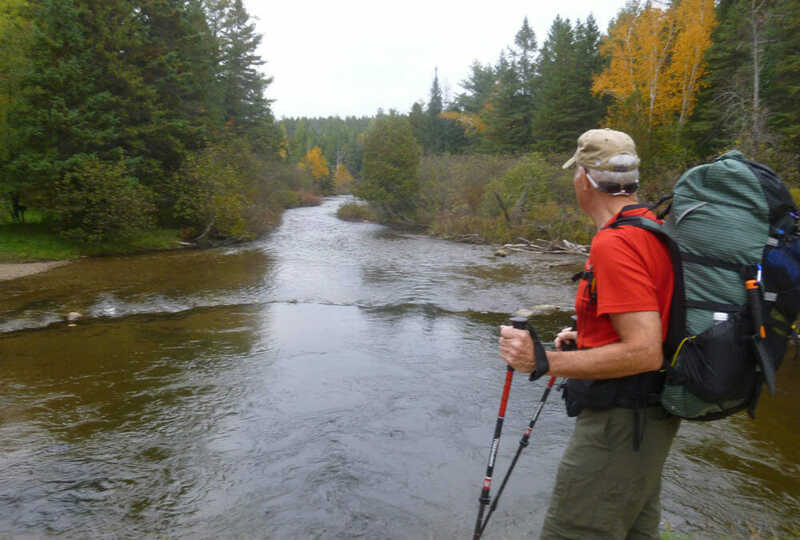 Pick any stretch of the more than 50 miles or North Country Trail in our area, or hike the Manistee River Trail between Hodenpyl Dam and Red Bridge, or maybe walk the Fife Lake Loop Trail north of Cadillac, or just explore any of the myriad of two-tracks that weave through the Manistee National Forest. While a good pair of walking shoes may be all that’s needed if you’re only going to be out for an hour or two, beyond that it’s a good idea to load a few items into a day pack. Changeable weather, a twisted ankle, hordes of insects, getting lost – you can’t always predict what might happen on a hike. 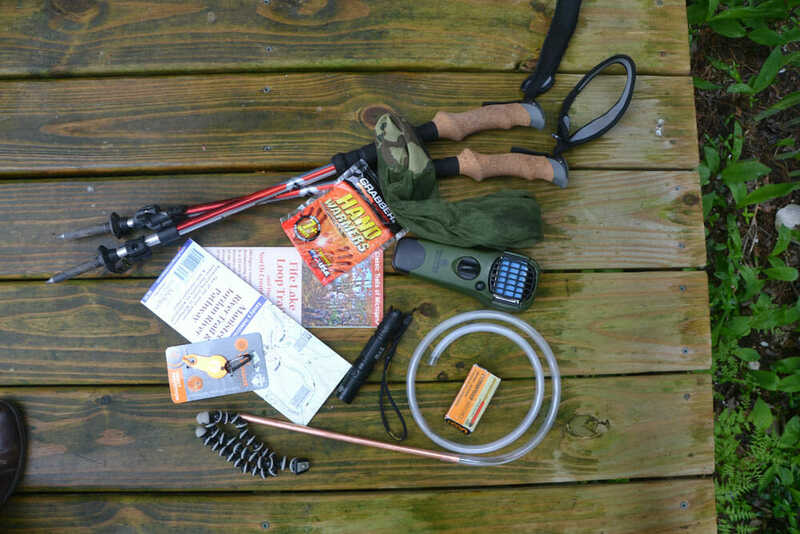 Since it’s logical that everyone will have some basic items like sunscreen, insect repellent, sunglasses, hat, Moleskin for blisters, water, snacks, headlamp (it there is any chance you might return after dark), I will highlight some items that might come in handy, but you may not have thought about bringing. 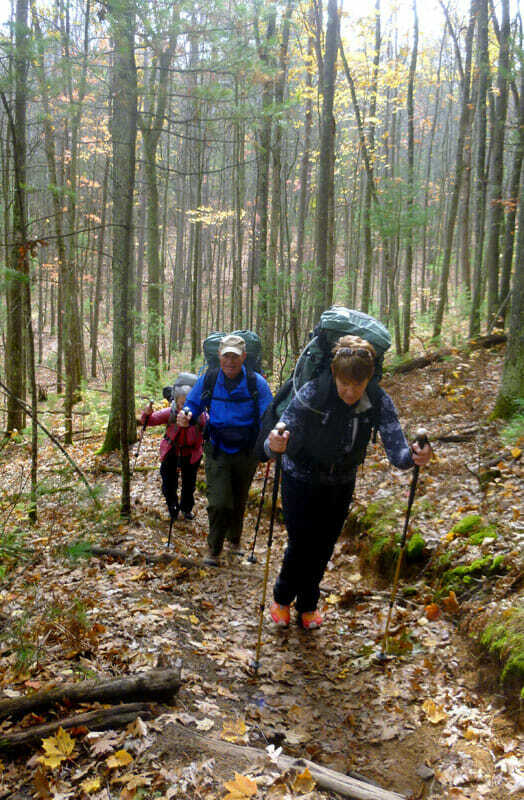 Even though you may not have any knee problems, an afternoon of walking the up-and-down terrain of the Manistee River Trail or along some parts of the North Country Trail, may make your joints ache. Using poles can minimize the discomfort by taking the strain off knees as well as help you keep your balance. For those who walk for fitness, using poles provides a good workout for your arms. Adjustable poles sell for seventy to a hundred and fifty dollars. I had never heard of a ThermaCell@ until my fishing companion brought one out on a trip. Within a few minutes after he had inserted a butane cartridge into the ThermaCell@ the mosquitoes that had been bothering us disappeared. Best used where there’s no wind, an activated ThermaCell@ clears bugs away from the immediate area around you. Not as effective when you’re moving, but when taking a break or sitting around a campfire, it’s great to have one. Retail cost is about 25 bucks. The cellphone camera, which allows you to photograph yourself by holding out your camera out in front of your face has probably deadened the sales of tripods. However, if you want to do a group shot, or desire to include some background in the picture, a tripod still is valid. The Gorilla tripod, with its bendable arms, enables you to set your camera just about anywhere. It weighs next to nothing and can fit in your pocket, which makes it the perfect item for camera enthusiasts who love the outdoors. There is an array of styles priced between twenty and forty dollars. When it’s cold, it’s my hands that suffer. I’ve had to quit cross country skiing, leave sporting events, and end fishing trips early because my fingers were numb. I bought a a package of ten “Grabber Hand Warmers” for ten bucks and now can hang tough on bitter cold days. The Hand Warmers are activated by opening the package and they stay warm for seven hours. When the buzzing of mosquitoes fills the air or a cloud of black flies descends on you, having a polyester mesh head net to slip on can be a lifesaver. Any store with a decent stock of sporting goods will have these on hand during bug season. Selling for two to five dollars the cost is cheap and the relief provided is priceless. If you have ever found yourself kneeling next to a dying camp fire or wood stove blowing air to try and coax the embers to flame, or are trying to keep wet or green wood burning, you will love a fire tube. And they are easy to make. At a building supply store, purchase a three-a-half foot section of 1/2” X 5/8” vinyl tubing and a one foot section of copper tubing. Shove the copper piece into the vinyl tube and hammer the copper end to flatten it somewhat to concentrate the air flow. For the cost of few dollars you will be able to nurse anemic fires to life without ever leaving your seat. Jim Dufresne has been creating great outdoor guides for years. 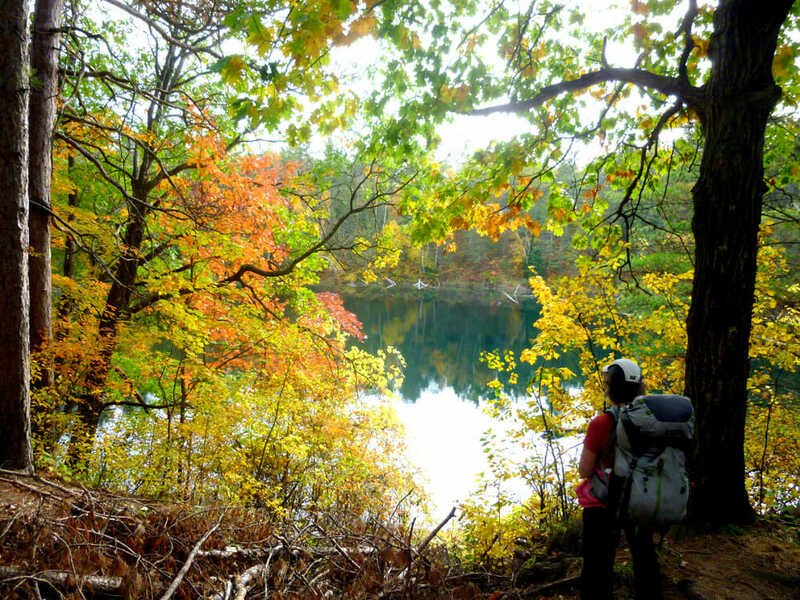 Now he is exploring Michigan’s trails and putting out laminated folders with detailed topographical maps telling you everything you need to know to hike a trail plus providing extra information about the history and nature of your route. 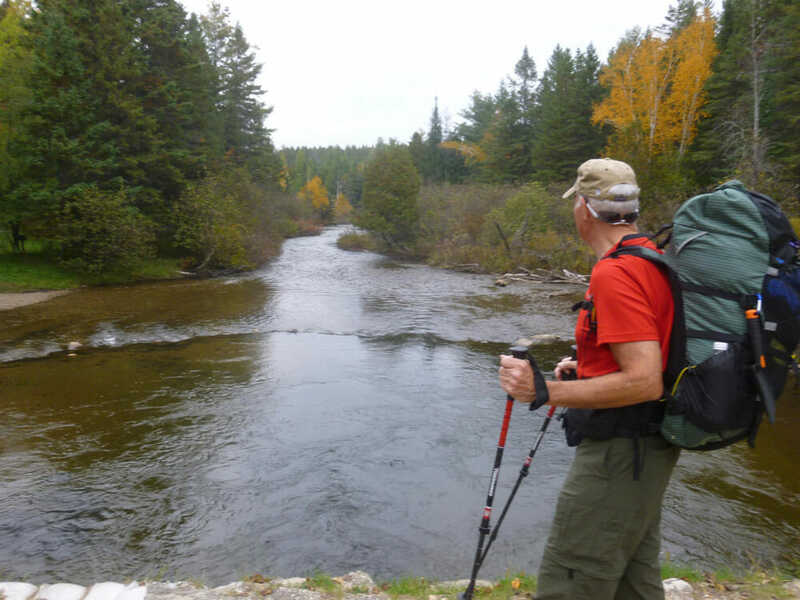 His maps cover area trails such as the Manistee River Trail and the Jordan River Pathway. Guides sell for five bucks each.